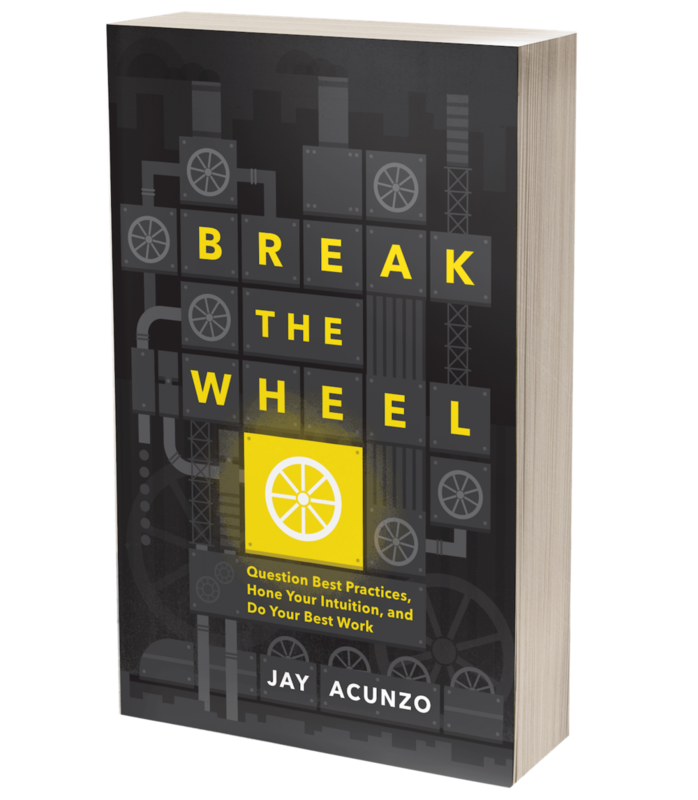 The Foraging Choice: The Choice That Makes or Breaks Your Work — Jay Acunzo | Author. Speaker. Maker of Shows About Work. I married way, way up. My wife holds a PhD in psychology, to say nothing of her warmth, her humor, and her beauty both inside and out. As a result of all that, despite her insistence that I stop (oh yeah, she's humble too), I brag about her to everyone who asks and way too many people who didn't. Because I married way, way up. I'll share a given concept with her because I'm utterly convinced that the entire business world needs to hear about it. It will transform the way we think about creativity, marketing, or business. Babe! This idea! It’s so powerful! What do you think?! A polite smile. A subtle nod. She's known about it since undergrad. Fortunately, because my wife is great (have I mentioned that yet? ), she doesn't just leave me hanging. When she sees the thread I'm working so hard to pull, she'll casually walk around the corner, gather up the giant friggin' quilt sitting just out of my view, and gently place it in front of me. Oh. So that's... I mean. Yes. That. This. This is better. Thanks, babe! Like I said: I married way, way up. Oof. Kinda feels like most people in the working world choose the former, no? That word “exploiting” just hits home so hard. If we aren't stuck doing the same old things we've always done, the same way we've always done them ("because that's how we do things around here"), then we're latching onto a new trend or guru-granted technique for dear life. Either way, when we find something we believe works, we enter Exploitation Mode. We cling to it. We obsess over it. We beat. it. to. death. Business bros pose during YouTube pre-roll ads, professing to know the "secret" to making more money, more quickly, in less time, and also unicorns and dragons and Santa are real. LinkedIn users film walk-and-talk videos sharing profound career lessons, hold the profound, hold the career lessons. People on social media @-mention 25 others in their latest post, claiming to be adding value to them. In reality, they're trying to feign engagement in order to flag to the algorithm that their content is high quality enough to surface higher in the feed. It all adds up to a bigger pile of crap than even Santa's very-real flying reindeer can produce. “Many decisions that humans make resemble foraging problems in which a currently available, known option must be weighed against an unknown, alternative option." So why do we seem to lapse into exploit mode? Why, when something we know (or others claim) delivers results, do we get complacent or stagnate, rather than continually exploring new potentially better possibilities? Easy: Stress. Maybe that’s why people love exploiting a tactic when it relates to an algorithm specifically. They depend so much on these third-party channels to do their work, and right when people finally, mercifully understand how to use a platform responsible for all this constant, breakneck change ... the algorithm changes. So if an expert claims a technique works, it's like finding a bounty of acorns in a tree. The stress of constantly searching through branches and leaves, avoiding predators, trying not to fall, worrying that you picked the wrong tree or maybe forest seems to melt away. In its place, you feel certain that THIS TREE is the place to be. When you consider that algorithm changes are but one of an endless list of stressors in our work -- stressors that also include bosses, colleagues, family and friends, customers or clients, and our own desire to succeed -- it's no wonder we tend to exploit our current position. We're in a familiar tree. So what happens when we want to do something better? What if we're sick of redundant, tired approaches or commodity junk? What might cause us and, more importantly, those around us to go exploring? According to the study, it all starts by understanding your environment first. "The average reward rate of the environment serves as the optimal leaving threshold because it effectively sets the opportunity cost of time spent exploiting the current option. When the instantaneous reward rate of the currently depleting option falls below this level, an animal's time would be better spent during something else." You just got Scienced, I know, so let me translate a bit. Basically, we need to spend more time understanding our context as a precursor to the foraging decision. Because we know our existing position so easily, it can be tempting in times of stress to continue to cling to it and explore it. However, if we knew what was happening in the real world around us, we could more accurately and confidently make the decision to try something else. Here's an easy example: In a world where everyone obsesses over publishing short, snackable content, you realize that both your audience's desires or sensibilities and your own skills allow you to write long-form emails instead. Another example: If you're not sure whether to leave your job, and you can understand the opportunities available in the broader job market (as one example of your "context"), then that can help you leave your existing position with more confidence. Okay, kind of obvious, no? But here's the issue: When we experience chronic and acute stress, we don't take the time to understand our environment. We revert back to the current position. In the career example, if you're focused on landing The Ultimate Dream Job Right Now Or Else, or you're so fried from working late or working under a crappy boss, or you're convinced something is wrong with you because your company is supposed to be a great place to work ... then that stress might cause you to stay put, even if your context clearly demands that you go exploring. Ever wonder why friends can nonchalantly point out solutions to your struggles that seem so obvious to them? We're convinced "it's not that simple," but maybe it is and we're just too stressed to see the world clearly. Stress clouds our vision and impairs us from making good decisions. We already know this. However, what we don't realize is that this triggers our psychological impulse is to keep hammering away at a current thing (job, tactic, relationship, etc.) when it makes more sense to explore new possibilities. So how do we gain clarity during all our stress? What might cause us to make better foraging choices and go exploring rather than keep exploiting? Unfortunately, the study doesn't say. In fact, their hypothesis was about the problem, not the solution. They explored whether "subjects under stress would demonstrate greater exploitation of, or lower reward thresholds for leaving, current options." The report was about the downside. For us to make better decisions, however, I think we need to focus on the upside. We need a reason to pick our heads up from our current position every so often to investigate our environment. In my research for the book, I found the same pattern in people who go exploring -- one that suggests we can use a simple mental heuristic to focus on the upside of our environment, rather than endlessly cling to our existing tree, scared of the downside of leaving. I call this heuristic "aspirational anchors." So what are they and how do they work? That’s next week in Part II. Posted on September 11, 2018 by Jay Acunzo.